The Light Blues still weren’t at their best against Gardner Speirs’ men but there was a notable improvement on some of the team’s most recent showings. And with more composure, guile and creativity than we’ve sometimes seen lately, there’s no doubt this was a deserved victory. Goals from David Templeton and Fraser Aird had the new title holders cruising at the midway point. Kane Hemmings’ first competitive goal for the club after the restart and a second from Templeton then sealed the success. And although Lawrence Shankland netted for the home team late on, the four goals before his sent the majority of an 11,492-strong crowd home happy at the final whistle. Bizarrely, Gers’ best head-to-head record in the league this season has come against the Spiders despite them being impressive opponents at times. This game rounded off a collection of four wins against the Mount Florida team, with just that Shankland counter conceded in those fixtures. 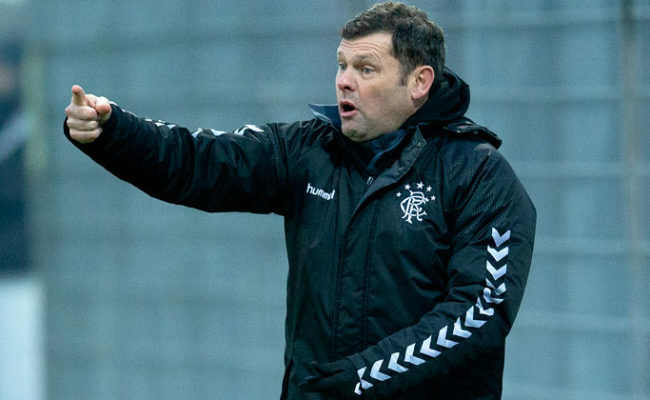 It also sent the Ibrox side 24 points clear in the championship, with only four games left now against Clyde, Peterhead, East Stirlingshire and Berwick. 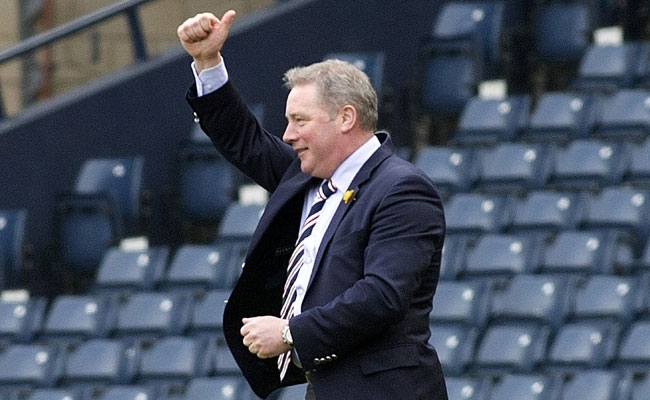 Manager Ally McCoist’s pre-match plans were hindered somewhat by the fact Ross Perry hurt his hamstring again in training yesterday. Nevertheless, that didn’t stop him from moving Lee McCulloch up front and Sebastien Faure featured at centre-half with Anestis Argyriou next to him in place of banned Chris Hegarty. Aird also came in on the left side of midfield as a replacement for Hemmings, who dropped to the bench. The opening exchanges were fiercely contested, with David Anderson lucky not to receive any punishment for clattering into Ian Black in an aerial challenge. Indeed, that made Robbie Crawford’s booking for a lesser foul on Aidan Connolly moments later a curious one. Aird had the first opportunity as he cut in from the left and shot with his right foot, just as he did when he got the winner at Hampden back in December. This time there was no repeat, however, as the teenager’s effort was comfortably held by home keeper Neil Parry. Boss McCoist was looking for his players to take a direct approach and he used David Templeton in behind McCulloch. The ex-Hearts star linked well with the captain and almost worked his way to an opener after a tricky run, with McCulloch’s rebound shot blocked after the initial effort was saved. At the other end, the hosts should really have gone in front when Jamie Longworth got ahead of Lee Wallace to get on the end of Andrew Robertson’s cross. But the striker made a hash of his header and was made to rue the fact he sent it wide when Rangers went in front after 18 minutes. Templeton was the scorer, lashing home his 12th Light Blues goal of the season from 20 yards after good build-up play involving Wallace, Kyle Hutton and McCulloch. Parry managed to get a hand to the rising drive but it wasn’t enough to keep it out and the lead was deserved for some enterprising play from the away side. The goal ended a run of 215 minutes without a goal following recent 0-0 draws with Stirling and Montrose – and a second strike almost followed soon after. McCulloch was unlucky to be denied after he poked the ball into the net only to see his effort flagged offside. The forward looked to have timed his run well as he latched on to Templeton’s through ball but linesman David McKniff appeared to make the right decision, albeit fractionally. Black and McCulloch both went close with free kicks as the visitors took more and more control of the game. And sure enough, they did go two up 10 minutes before the break when Aird found the net from close range. 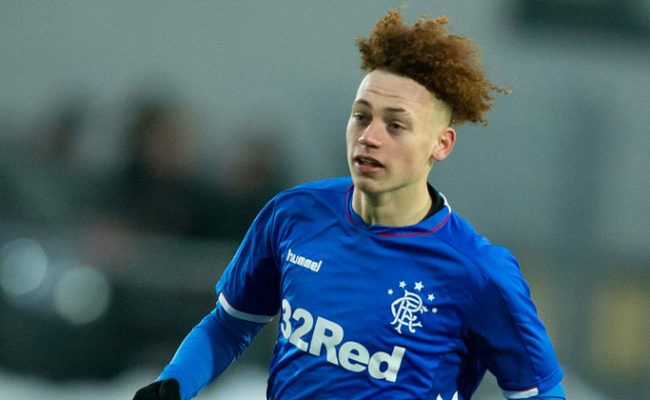 Some players have certain teams they enjoy coming up against and that’s certainly the case for the Scottish youth international. As well as that strike against the Spiders just before the turn of the year, he netted against them when the SFL Reserve League was clinched at Ibrox back in February. This was the simplest of his three goals as he poked in on the line after Parry had palmed McCulloch’s volley after Black’s free kick into his path. Richard Little blasted just wide of the mark from a free kick as the hosts tried to respond while Hutton was off target after terrific running down the left by Wallace. Templeton also wasn’t far away on the stroke of half-time with an audacious effort from 50 yards after he spotted Parry off his line. The second half lacked the same pace and incidents the first often had and as Rangers’ own tempo dropped, Queen’s Park raised theirs. But while they had a variety of chances to test Neil Alexander, the ever-present shot stopper rarely had to do more than the bare minimum to keep them at bay. McCoist introduced Hemmings for Argyriou in a bid to pick up the pace again and his effort killed the game as a contest with 22 minutes left. Templeton set him up as he burst down the left then squared for the Englishman to fire home a powerful effort from the edge of the area. 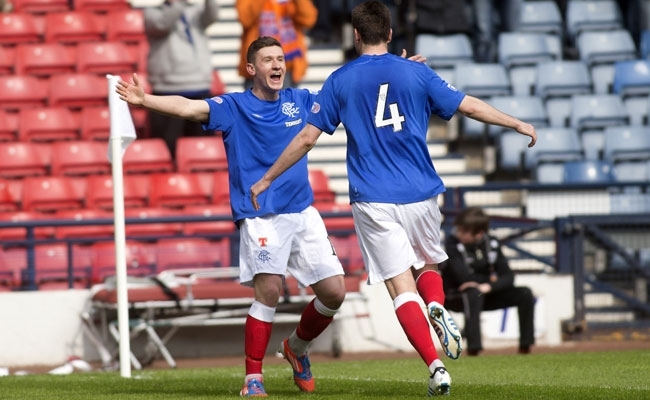 Grabbing his first for Gers sparked an emotional celebration from the striker, who turns 21 tomorrow. 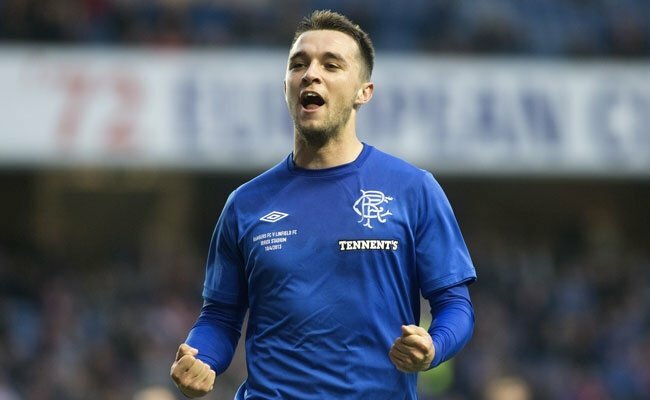 Having scored four times in four games at one point during a loan spell at Cowdenbeath recently, he’ll hope breaking his duck for McCoist’s side can win him a new contract. Hemmings’ contribution was added to by a stunning 20-yard rocket from Templeton after Barrie McKay’s pass and that capped a fine afternoon’s work. Although Shankland steered in a header a minute later, things look as though they’re on the up again for Rangers. QUEEN’S PARK: Parry; Gallacher, Little, Bradley, Robertson; Connolly (Burns 67), Anderson, McParland, Spittal (Shankland 80); Longworth, Keenan (Quinn 84). RANGERS: Alexander; Argyriou (Hemmings 59) (Naismith 90), Faure, Cribari, Wallace; Crawford (McKay 77), Black, Hutton, Aird; Templeton; McCulloch. SCORERS: Templeton 18, 86, Aird 35, Hemmings 68.